Sand Magic Creations provides a wonderful, low cost children's business opportunity that you can run from your home or office, part-time or full-time. 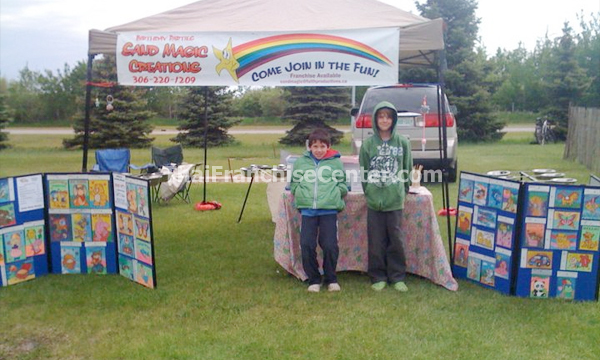 History Sand Magic Creations provides a wonderful children's business opportunity that you can run from your home or office, part-time or full-time. You don't need to have a business background or any special knowledge of children's toys or hobbies. We will teach you everything necessary to get you started and we will be there to provide help and support for as long as you need it. & Services Sand Magic Creations are cards that have been lazer etched with an adhesive backing and come with a selection of colored sands. Children use a stick provided to peel off the outline from their chosen image which they then fill in with a dark coloured sand. They continue to peel off the plain paper covering each portion of the image, sprinkling in colored sand as they do so. The sand sticks hard to the image and they end up with a beautiful picture of a butterfly, car, teddy, penguin or other favorite. There are 18 different coloured sands and literally hundreds of images representing several themes to choose from, including nature, sea life, cars, Christmas, celebrations, pets and many more. Each card comes with a plastic sleeve for protection of artwork on completion. Our card stock is constantly changing and being updated with great new designs. We'll even design a custom image for a child's favorite theme or for a parent who wants to surprise a child! etc. Is there a better combination than sand, stickiness and pictures to give a child hours of absorbing, creative fun? We think you'll agree this is one of the best business opportunities on the market for people who want a great product that they can provide from home to new and repeat customers for a low investment. Why wait? You could be up and running in a few short weeks, making money and bringing a smile to your customers' faces! Choose from two packages, one for just $4,000 and the other for $10,000.